Commercial table tops with laminated plastic horizontal surfaces are made with a 1 1/8" 45 lb. high density industrial particle board core. 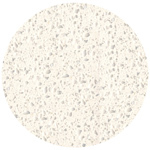 The particleboard core is laminated on top with .042" thick decorative high pressure plastic laminate and on the bottom with a .025" phenolic balance/backing sheet. 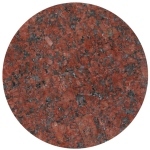 Choose standard Wilson-Art and Formica brand laminates for best delivery times and pricing. The vertical edges of basic restaurant tables can be handled in a variety of economical ways. Table edge selection decisions depend on budget, function, durability and design criteria appearance. 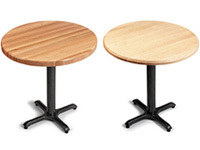 The most popular and least expensive Basic Restaurant Table Top Edges are shown below. We offer more difficult to find commercial tables in U.S. grown Oak, Maple, Ash, Walnut and Cherry including exclusive urban industrial finishes. 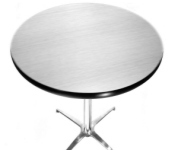 Choose from two different styles of decorative Stainless Steel Table Tops, Granite and Quartz Table Tops, Quick Ship Budget Laminated Plastic Tables, Padded Dropleaf Tables, Quick Ship Solid Wood Tables, Photographic Image Custom Tables And Budget Wood Veneer Tables all designed specifically for restaurant use. Restaurant pedestal style economy cast iron and steel table bases for square, round and rectangular table tops. Both bar height and dining height table bases are available as well as Wall Mounted Cantilever Table Supports. Table bases made with steel columns, cast iron bottoms, cast iron or steel top "spiders" held together with threaded steel rods are the workhorse standard in the restaurant industry. Most basic restaurant table bases shown here require some simple assembly. No special tools or skills are required. Large tabletops require sufficient support. In addition to an appropriate table base bottom size it is important to determine if your top will need multiple vertical columns, large diameter columns, oversize top plates or oversize spiders. Table bases and table legs for permanent installation, special purpose temporary and deluxe table base styles. Bolt down floor mounted table bases, adjustable height table bases, chrome table bases, stainless steel table bases, heavy duty flat steel table bases, heavy duty crossfoot table bases, stamped steel table bases and Victorian style cast iron reproduction table bases for institutional and commercial interiors. And Two New Matching Bar Stools. Unless otherwise noted all the table bases require some simple assembly. Steel and cast iron top plate spiders may vary. You should never use a restaurant style pedestal base that is too small to support your table top. We show table base price in small quantities. If your table base order is of a large size we would be happy to quote accordingly. code so that we can include accurate freight charge estimates. Room size, shape and function determine the layout of tables in a restaurant dining room. Having the right combination of sizes of tables in a restaurant can decrease wait time for customers and can maximize seating capacity and profit. Drop Leaf Restaurant Tables can accomodate changing seating requirements and configurations. The traffic flow plan of patrons and wait-staff, adequate aisle space and safety requirements are also key factors in designing a dining space. Keep in mind a percentage of wheel chair accessible restaurant table areas must be provided. Table Top Size determines what type and how many table supports will be needed. Table bases and table tops come in many different styles and price ranges. Commercial table tops and table bases are usually sold separately. Generally, table tops are NOT predrilled on the underside for table base attachment. We are an experienced, specialized source for professional, commercial seating and tables used in restaurants, bars, schools, theaters, museums, libraries, churches, courtrooms, medical facilities, correctional centers, retail stores, television and film productions, business offices, night clubs, country clubs, casinos and hotels. We sell wood tables, granite tables, stainless steel table, laminated plastic tables, budget table bases, bolt down table bases, stainless steel table bases, metal table legs and table hardware. We also sell restaurant chairs, restaurant booths, banquettes, floor mounted stools, park benches, waste receptacles, lounge chairs and cafeteria seating. Custom furniture is our emphasis but we also provide a complete offering of standard restaurant chairs ,table tops, booths, bar stools, foodservice cabinets and outdoor seating.